WINSTON-SALEM, NC – (April 21, 2016) Wake Forest University School of Business students who performed at the highest academic level in 2015-16 were inducted into the national Beta Gamma Sigma honor society on April 19 in a ceremony in Farrell Hall’s Broyhill Auditorium on campus. Membership in Beta Gamma Sigma is the highest recognition a business student can receive in a business program accredited by the Association to Advance Collegiate Schools of Business (AACSB) International. The Wake Forest University chapter of Beta Gamma Sigma dates back to 1961 and is one of more than 540 campus chapters worldwide. Senior business and enterprise management major Ella Ryan leads the chapter this year. Wake Forest University congratulates the following inductees at the baccalaureate level. They earned membership in Beta Gamma Sigma for being ranked in the top 10 percent of their class:Juniors Evan Marcus Adonailo, Rachel Anne Courtien, Kelly Marie Dulin, David John Erickson, Emily Mary Haggerty, Christiaan Hodgson Adriaan Honig, Junlin Huang, Brynn McCarthy Jackel, Nicholas Arthur Karp, Heather Rozella Key, Jacob Aaron Lown, Dana Helen Matuozzi, Caroline Julia McGavock, Alexa Elizabeth Modica, David Patrick Oberkircher, Celine Vanderclock Olcott, Kun Qian, Alyssa Joy Raguso, Austin Davis Rosenthal, Lauren Leigh Schrager, Rachel Cross Simmons, Sarah Bishop Thornhill, Jian Wu, Paul Christian Yamane, and Jiongqing Yao and seniors Emily Elizabeth Bandyk, Austin Leopold Beltz, William Gordon Carter, Matthew Bryce Cohen, and Aubrey Joy Ransdell. From the Master of Arts in Management program, these students were inducted: Grace Elizabeth Auton, Madison Kendall Brown, Laura Jane Burris, Shaun May Casey, Alexandra Louise Cella, Brittany Coleman, Rachel Lynne Connor, Aaron Gabriel Fossas, Maleek Erik Frazier, Joshua Andrew Gregory, Benjamin Bishop Hartshorn, Timothy M. Hines, Victoria Hunter Hitz, Ruigang Jia, Rachel Ellis Jordan, Taylor Kirkland, Antonio Maurice Kornegay, MaryClaire Cathey Martin, Blake Michael McClaren, Donald William McCullough, Ryan Patrick Morse, Thomas Xavier Petrini, Mary Katherine Prince, Ashley Paige Rivenbark, Erica Sachiko Robertson, Yue Tan, Ryan Parker Wallance, Jenny Johanna Warnken, Melanie Katherine Williams, and Lu Yuan. Master of Science in Accountacy students inducted include: Kyle Matthew Bessette, Nicholas A. Biumi, Taylor Nicole Bourg, Alexandra Lee Brink, Connor Maurice Carlis, Yingying Chen, Kevin James Conlon, Amy Marie Fosina, James Warren Haught, Jillian Ann Lieber, Matthew Griffin Mancuso, Andrew Taylor Moharam, Madison Lynn Newman, Camilla Paramore, Katherine Gail Stewart, Carolyn Anne Stone, Aubrey Elizabeth Waggoner, Caroline Elizabeth Wayco, and Iris Haley Wigodsky. Students inducted from the Master of Business Administration programs include: Kevin Batchelor, Nathaniel Richard Bell, Melissa Kay Berry, John Paul Burns, Jared Robert Christman, Heather Ann Duke, Mark Timothy Generalovich, Andrews Godoy, Wesley David Horne, Ishaan Kapoor, Justin R. Leazer, Raphael Francois Joseph Lobregat, David Samuel Lower, Sarah Catherine Lupton, Stephen Marcil, Patrick Thomas McGrath, Steven Michael McKee, Mehgan McMillian, Garrett Morgan, Rebecca Ann Oring, Dana Shawn Overcash, Darren Michael Pierce, Camilla Robinson, Harshad Chandrakant Sali, Jordan Phillip Sheik, Liron Shitrit, Bradford Smith, Alysa Sommer, Kevin Michael Turner, Jordan Michael Allred, Christopher Charles Barber, Amanda Leighanne Davis, David Weston Miller, William Holt Montgomery, Brandon Glenn Pegram, Shannon Clauss Pierce, Brian Patrick Vail, Alyssa Beth Valdez and Matthew England Wagner. James Warren Haught, David Samuel Lower, Madison Lynn Newman, Darren Michael Pierce, Camilla Robinson, Katherine Gail Stewart, Carolyn Anne Stone, Aubrey Elizabeth Waggoner, Caroline Elizabeth Wayco, and Iris Haley Wigodsky. 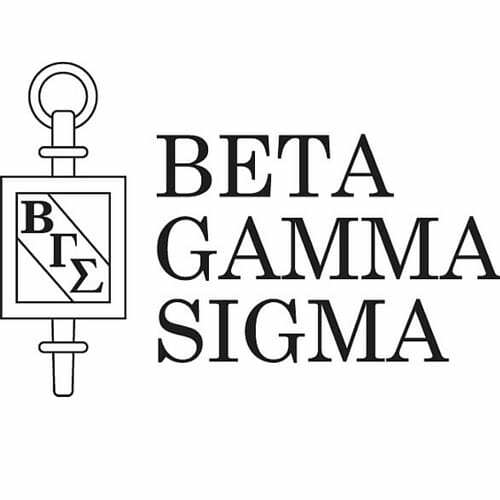 Beta Gamma Sigma has inducted more than 750,000 outstanding students into membership since its founding in 1913. Members currently reside in all 50 U.S. states and more than 160 countries around the world. The Wake Forest University School of Business offers undergraduate programs in accounting, business and enterprise management, finance, and mathematical business. Our graduate programs include a Master of Arts in Management, Master of Science in Accountancy, Master of Science in Business Analytics, and a Master of Business Administration. Our programs are consistently ranked among the world’s best in surveys by U.S. News & World Report, Businessweek, the Economist, Forbes, and the Financial Times. Wake Forest accountancy graduates rank first for all test takers among large and medium sized schools and have ranked in the top 2 among first time test takers for 16 of the past 17 years.